The Driver Qualification Test (DQT) is a two-part test that allows you to move from your green Ps to a full licence. You can attempt the DQT when you have accumulated at least 24 months experience on your green Ps. Part 1 is a Knowledge Test of safe driving practices. The test consists of 15 multiple-choice questions, each with 4 possible responses. It is an advanced version of the Driver Knowledge Test you passed to get your Ls. The questions can test any information from the RMS Driver Qualification Handbook. You get 3 practice questions with feedback before you begin Part 1. Part 2 is an advanced version of the Hazard Perception test you passed to get your green Ps. It tests your ability to recognise and respond to potentially dangerous situations and react appropriately. The 10 questions are more difficult this time as the clips are longer and may require multiple responses (more than one safe gap, overtaking opportunity or hazard requiring you to slow down). You get 2 practice questions with feedback before you begin Part 2. 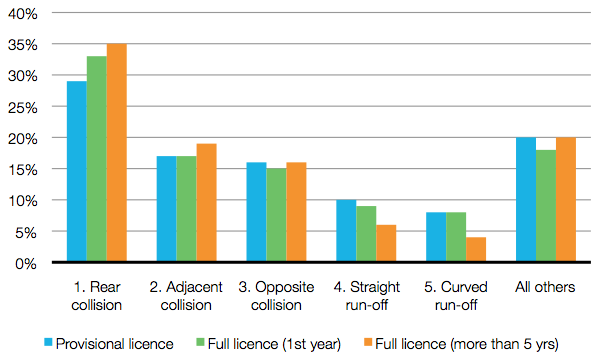 Crash patterns for provisional, first year full licence and more experienced full licence drivers are different. Drivers with more experience have more crashes where they run into the back of another vehicle and run off the road less (straight or curved). So people get better at staying on the road but follow too closely behind other vehicles. Figures for the other crash types remain consistent regardless of experience suggesting that turning, crossing intersections and overtaking remain a challenge regardless of experience. Alcohol and fatigue are also major contributors to crashes.